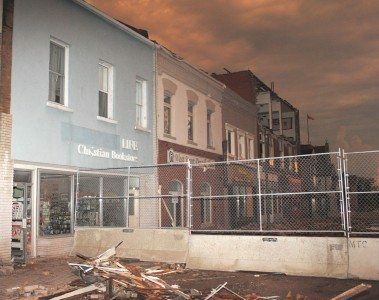 Three of four bookstores in Goderich, Ontario, along with the town’s public library, remain cordoned off by police after a tornado ripped through the lakeside community of 8,000 around 4 p.m. Sunday afternoon. The twister, packing winds up to 300 kilometres an hour, ripped part of the roof off Fincher’s bookstore. The shop remains otherwise intact. Owner Tom Fincher is mindful of how lucky he is, considering the storm killed one person and injured 37 others.